The Society of Uniformed Services Psychiatrists (SUSP) is a district branch of the American Psychiatric Association (APA). For Guard and Reserve, please contact us for more information. SUSP is the proud recipient of the prestigious APA District Branch Best Practices Award for 2018. The award recognizes their Interactive Online CME Series, Military and Veteran Health. There are four Webinars in the series. This work was accomplished collaboratively with using an APA Innovation Grant. 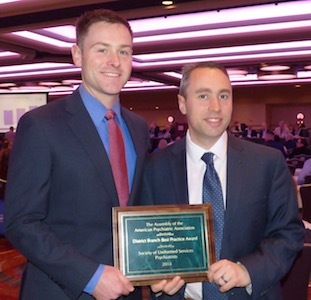 Vin Capaldi (SUSP President 2017-2018) and Eric Meyer, (SUSP President 2018-2019) accepted the Award at the APA May 2018 Assembly. For more information go to: www.psychiatry.org/militarymentalhealth.